BSP (Bangko Sentral ng Pilipinas) has already mandated all banks to make the shift to Europay Mastercard Visa (EMV) chip enabled cards. With this, RCBC has been hard at work to ensure safer card transactions for its valued customers. The Bank is now in the final stages of upgrading its clients' cards with EMV chip-enabled cards. Shifting to EMV cards is part of RCBC's thrust to ensure safe and secure transactions for its clients. EMV is a global standard for transactions made on chip-based debit, prepaid and credit cards. Magnetic stripes on cards contain unchanging data, which makes it easy for anyone to replicate the data. That also makes old cards prime targets for counterfeiters, who use stolen card data to withdraw or purchase. Unlike the magstripe technology, every time an EMV card is used for payment, the EMV chip creates a unique transaction code that cannot be used again. It ensures safer transactions by authenticating each card and generating one-time codes for each payment. This makes it difficult for anyone to steal the cardholder’s account information. To enjoy the new EMV technology and its enhanced security features, RCBC clients can easily upgrade by going to their branch of account during the recarding period, from August 15 to October 15, 2017. They need to present only one (1) valid photo-bearing Government ID to upgrade their ATM Debit or their MyWallet cards completely, for free. Upon receipt of their new EMV card, RCBC clients can proceed to the nearest RCBC or RCBC Savings Bank ATM to activate their card. 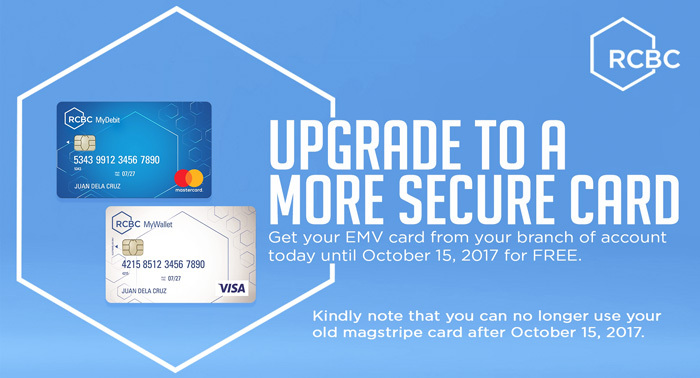 After October 15, 2017, all remaining RCBC magstripe cards will be automatically deactivated and can no longer be used in any transactions. RCBC clients are urged to make the shift before the deadline to enjoy more secure card transactions.